The CN710 Series temperature controllers offer easy-to-use programming menus designed for quick installation. These units are designed for direct or reverse acting (cooling or heating) control. 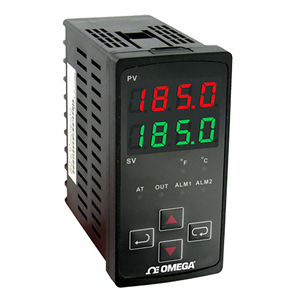 The CN710 Series can be programmed for simple ON/OFF or more complex PID control functions. PID control is supported with manual or autotuning. Select relay, DC pulse, or current output control methods. The controller also includes two additional alarm outputs. The alarm outputs can be configured from 12 different preprogrammed settings. The temperature controller accepts a variety of thermocouple and RTD inputs. The process value and setpoint value are displayed simultaneously on the large dual LED. Auto-tuning, engineering units (°F or °C) and alarm status is also indicated on the faceplate.